Started as a side project during the Jefferson Airplane days, Hot Tuna is a psychedelic blues rock collaboration between guitarist Jorma Kaukonen and bassist Jack Casady. Both artists have been regarded as forces in American roots and rock music, and were honored with Grammy Lifetime Achievement Awards in 2016. 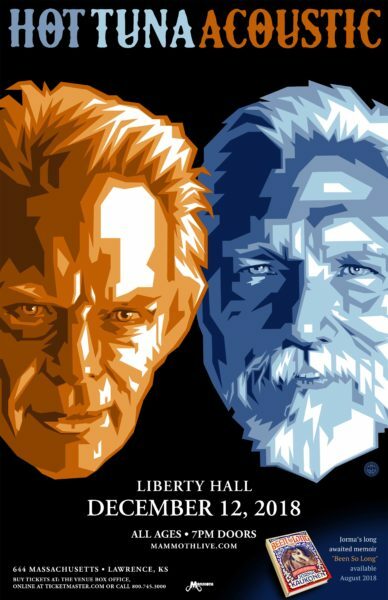 They will perform an acoustic set at Liberty Hall on Wednesday, Dec. 12! Tickets go on sale this Friday, but Bridge listeners can purchase tickets starting Thursday, May 31, from 10 a.m. to 10 p.m., by using the password BRIDGE after clicking on this link or the poster below!